Offering high performance and non-stick ease, this 4-pc. square copper cookware pan set lets you cook healthier—with quick, easy cleanup. State-of-the-art, copper-infused ceramic coating assures excellent food release without need for oil or butter, while lightweight aluminum construction assures rapid, even heating and oven-safe durability up to 500° (baking chicken pot pies, cinnamon rolls and more!). 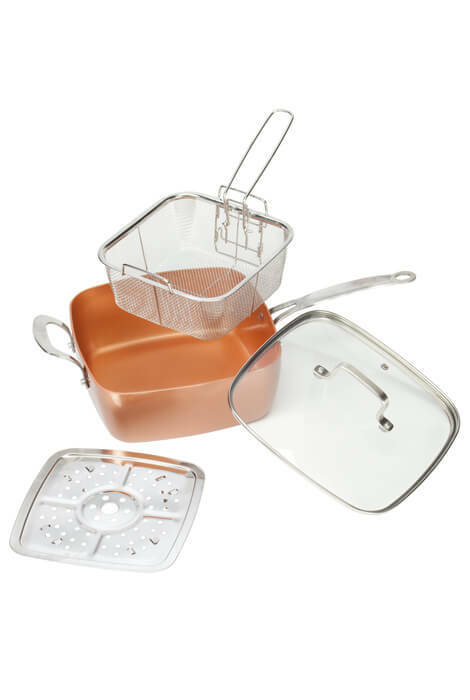 The square pan's unique shape doubles your cooking space for larger meals, while the set's included steamer rack and square frying basket help you create a wide variety of dishes. 4-pc. 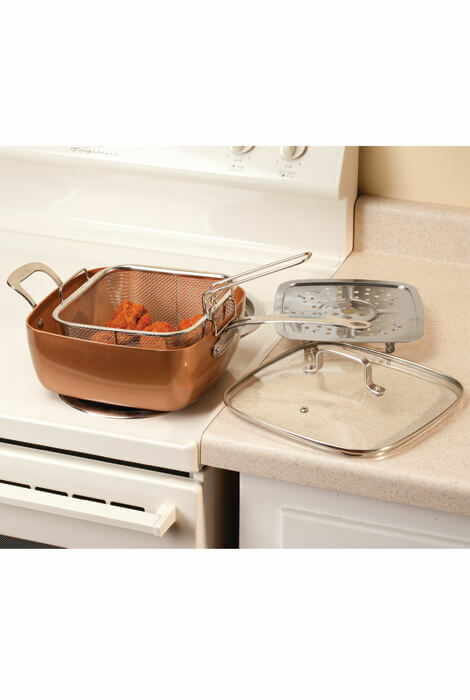 copper pan set includes square ceramic pan, tempered glass lid, steamer rack and frying basket. Ceramic pan's durable, scratch-resistant surface allows safe use with metal utensils. 9 1/2" sq. fry pan is ideal for use with electric and gas stoves. PFOA- and PTFE-free. Dishwasher safe.